Aurora Fantasy is a Natural material. 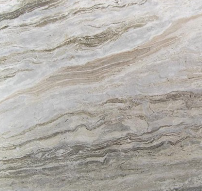 Aurora Fantasy is a priced Marble stone. Aurora Fantasy is a beautiful light marble with green, grey and brown running through it. Found in both traditional and modern kitchens it truly will stunning. It however is a softer material and will need more looking after. For full details please ask one of the sales team on how to maintain this material. Aurora Fantasy is a Natural Marble from India, Landford Stone offer this type of stone in a variety of thicknesses and finishes. Aurora Fantasy is a priced stone and will look incredible in your home!